The Violence in Nigeria: What's Behind the Conflict? Is Goodluck Jonathan the Answer to Nigeria's Woes? The machete killings of hundreds of villagers near the central Nigerian city of Jos on Sunday have thrown the sectarian problems of Africa's most populous nation into the spotlight again. Nigerian officials claim the latest bloodshed  most victims were Christians, many of them women and children  was retaliation for clashes in the same city in January. In that massacre, Christian attackers killed 300 Muslims. Nigeria has been wracked by periodic episodes of violence for decades. The country's 150 million people are divided about equally between Christians and Muslims and further splintered into about 250 tribes. Jos, some 300 miles north of Nigeria's largest city, Lagos, sits smack-dab in the center of Nigeria's tumultuous "middle belt," a so-called cultural fault line that divides the country's Muslim north from the Christian south. The "middle belt" is a melting pot where the major ethnic groups of Nigeria  Hausa-Fulani Muslims and Yoruba and Igbo Christians  usually coexist peacefully but sometimes collide. Many Nigerians argue that the real reason for the violence isn't ethnic or religious differences but the scramble for land, scarce resources and political clout. Poverty, joblessness and corrupt politics drive extremists from both sides to commit horrendous atrocities. Although the nation rakes in billions of dollars in oil revenue annually, the majority of Nigerians scrape by on less than a dollar a day. In Plateau State, where Jos is located, Muslim cattle herders from the north and Christian farmers from the south vie for control of the fertile plains. That poor distribution of wealth has also sparked conflict in Nigeria's oil-rich southern Delta region, where militants lobbying for a greater share of oil revenue regularly blow up pipelines and kidnap foreign oil workers. Andrew Kakabadse, professor of international management development at the U.K.-based Cranfield School of Management, says oil companies have at various times pitted ethnic factions against one another for economic gain. Kakabadse blames a lethal combination of outside oil interests, long-standing local conflicts and poverty for the sectarian strife. "In Nigeria the Christian-Muslim thing is the tip of the iceberg," he says. "What's underneath the water is a much more complex sociopolitical situation, which cannot be explained just in terms of the religious divide. You have a recipe ripe for conflict, and it just so happens to be Christian-Muslim." 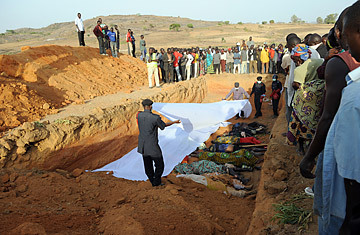 Violence among Muslim and Christian ethnic groups was largely kept in check by a succession of military regimes until 1999, when Nigeria returned to civilian rule. While democracy permits greater freedom of religious expression in Nigeria, it has also intensified the political and economic friction between ethnic groups. Rioting in 2001 killed more than 1,000 people, and subsequent outbreaks in 2004 and 2008 killed another thousand. Smaller but no less vicious attacks in 2009 claimed dozens of lives. Police have arrested more than 90 people for their alleged roles in this week's massacre. Washington and international human-rights groups are calling on Nigeria to prosecute and punish those responsible. "It's time to draw a line in the sand," Human Rights Watch researcher Corinne Dufka said in a statement. "The authorities need to protect these communities, bring the perpetrators to book and address the root causes of violence." But even if that happens, the violence is unlikely to end altogether.